DOLCE was founded in 2017 by Serena De Filippis and it is both the result of her passion for baking and a personal challenge with a desire to get back in the game. ​ She was born and raised in the beautiful city of Naples – in the south of Italy, in a traditional neapolitan family where "cooking" has always meant not just "making food" but a way to take care of the people you love. ​ After earning a law degree in a renowned Italian university, Serena became a criminal barrister, spending hours of her days in court rooms and legal firms. One day, she realised that she was not happy with how her life was going on. So she decided to hang up the gown and don the apron: she wanted to become a professional Pastry Chef! That's why she moved to London, to pursue her true passion and reinvent herself. She first worked as an assistant Head Chocolatier in a luxury chocolate boutique, then as an apprentice Pastry Chef in an awarded French pâtisserie. After these working experiences, she decided to improve herself to the very best level and get the prestigious Diplôme de Pâtisserie at the world leading culinary school Le Cordon Bleu, in London. ​ Doing so, she just felt like she was following her real path and dream. 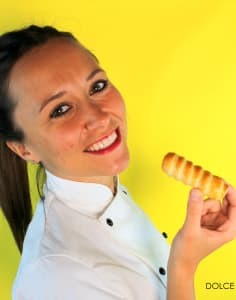 She created DOLCE with one ambition: to bring the Italian traditional "mini" Pâtisserie in London, but with a modern and young eye - giving her personal twist to the classic Italian pastries. A lot of people started to ask her to teach them all the secrets of her unique baking and that's why she started running her workshops, which are put together to show you the fundamentals of some classic Italian treats, while developing your creative flair to amaze relatives and friends and of course having fun! !